How dark is the Penumbra? An observer in Earth`s penumbra would see our planet partially covering the Sun, such that the occulted fraction of the solar disc would grow as he approached the axis of the shadow. 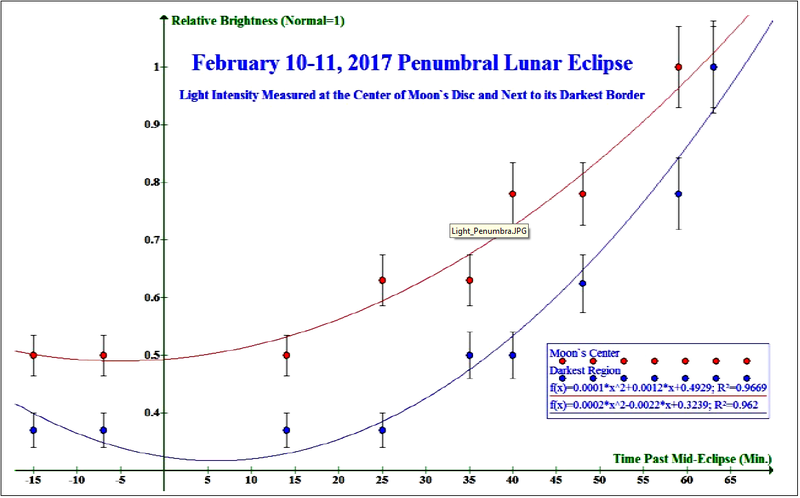 During the subtle lunar eclipse on February 10-11, 2017, the Moon crossed Earth`s southern penumbra and it did so in a way that it practically probed its entire radial extension, almost from its border with the umbra to its outer edge, becoming nicely framed within the penumbra at mid-eclipse. See the figure. Earth`s natural satellite then acted as a giant screen onto which the film of a partial solar eclipse was projected. As I was observing the eclipse, It occurred to me that I could the use the built-in light meter of my camera to get readings of the relative brightness across the Moon`s disc. Since the intensity of light within a small rectangular area of the image could be averaged automatically by the camera, I used a zoom magnification of 104x, so that the area of the Moon`s disc was 13 times larger than the sensitive area of evaluation. 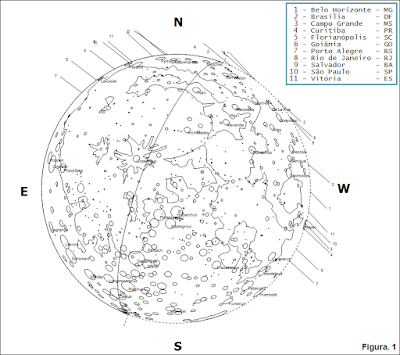 Then I centered it over three different spots of the Moon`s disc in order to get brightness readings for its darkest and brightest regions in addition to its center. I had set the camera to ISO=100 and 1/F=6.5. Then, as the penumbra advanced across the Moon`s disc, darkening it more and more, I would increase the exposure time in order to keep the readings provided by the metering sensor of the camera at the middle of its scale, corresponding to its optimal (recommended) level of light. I would then record the time and the optimal exposure time and repeat the procedure some minutes later. Recalling that doubling the exposure time would compensate for a 50% decrease in the intensity of light, several readings of exposure times were obtained as the eclipse progressed. 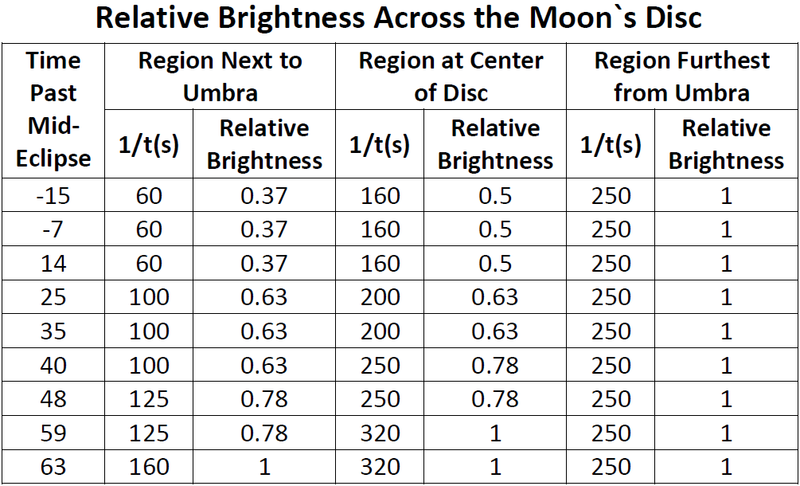 Fractions with respect to the normal exposure time of the full Moon (no eclipse), for each of the three areas surveyed, were then calculated in order to generate light curves for the Moon`s disc as it crossed the penumbra. 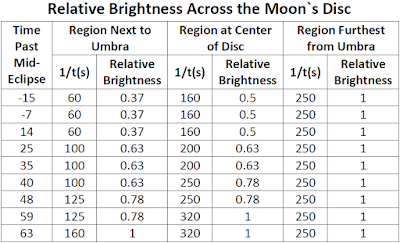 By inspecting the graph, it is possible to conclude that the brightness at the center of the Moon`s disc was reduced up to half its normal value (at mid-eclipse). Also a 1/3 ratio was found near the Moon`s edge next to the umbra. 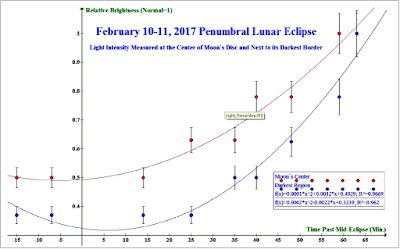 In addition, no significant change could be measured for the region closer to the outer edge of the penumbra that underwent little decrease in brightness. These figures look consistent if we recall that the magnitude of the solar eclipse as seen from the Moon was predicted to range from 0.97 at the border closest to the umbra to 0 (opposite border). 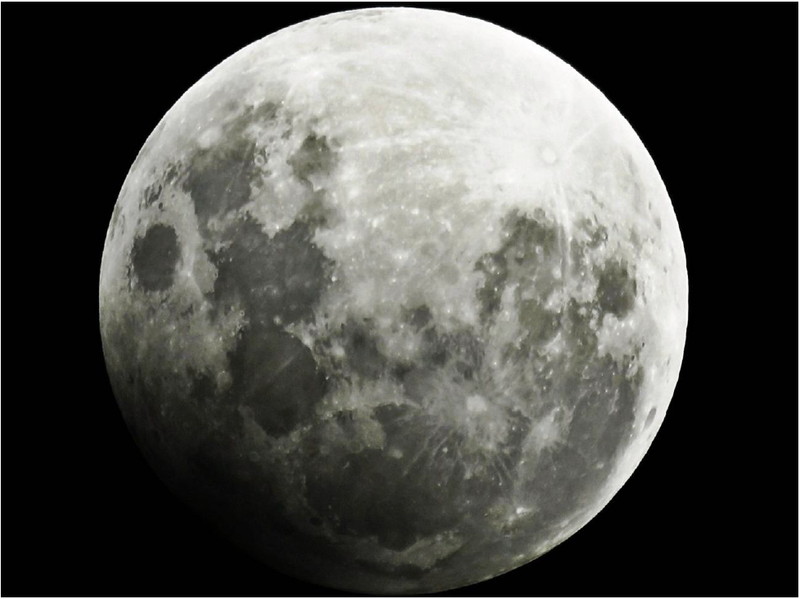 Indeed, assuming an arithmetic mean would approximately apply, then the amount of sunlight shining on the Moon was reduced to half at mid-eclipse in agreement with the 0.5 light ratio measured at the center of the Moon`s disc.